After enjoying his first Spring Training stint with the big club, No. 2 Orioles prospect Ryan Mountcastle received a rude welcome back when he returned to Minor League camp in mid-March. In his last at-bat of his first game, sitting on a two-strike pitch, he was presented with an up-and-in fastball and was unable to get his hands completely out of the path of the ball. The pitch hit his right hand, causing a hairline fracture that sidelined Mountcastle for about the first five weeks of the season. "Right when it hit me, I knew something was up," said MLB.com's No. 85 prospect. "This was my first-ever legit bad injury. I went into it without knowing much. I knew we had a good staff over there and they were going to help me get on the field as soon as possible." Mountcastle worked diligently to get back, finding the violent motion of a swing the most challenging baseball activity to normalize again, followed by getting his arm into shape after so much down time. 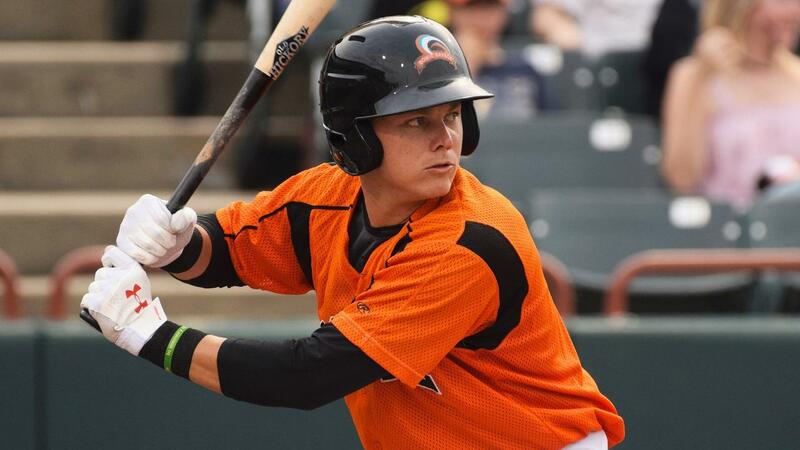 The Orioles' first-round selection of the 2015 Draft immediately proved ready in his season debut on May 10, going 3-for-4 with a run scored and an RBI versus Hartford. "It definitely helped the confidence and knowing that I'm back," Mountcastle said. Bowie hitting coach Keith Bodie was happy to get him. "He works at his craft," Bodie said. "He works at his defense, he works on his hitting every day. He's very diligent, pays attention, very focused." That work ethic, coupled with his natural hitting abilities, have some pining for the 21-year-old to help a struggling big league club at the hot corner. Though he did accumulate 275 hits over his first two full seasons, injury aside, Mountcastle is still in need of valuable playing time as he moves up the ranks and continues to learn the intricacies of the game. "The Minor Leagues are the Minor Leagues. The Major Leagues are the big leagues. There is a big difference," explained Bodie. "The only thing that will make it easier for him is his natural ability. He's gifted. He needs to play. He needs to develop his skills on both sides of the ball. It takes time." "You've just got to take everything with a grain of salt," he said. "You can only control what you can control. I'm just going to go out there and play hard every day, work hard and whatever happens, happens." While he's done well to control his bat, hitting .276 through 28 games with the Baysox, he continues to make strides in the field at third base, where he has a .964 fielding percentage despite having played only 56 games at the position prior to this season. Mountcastle is also beginning to show better plate discipline, having drawn nine walks already this year, where he earned 17 in 127 games last year. "So far, I've seen his plate discipline get a little better and that's encouraging," Bodie said. "All of the things that he brings to the table, he's still showing his power, his ability to hit balls to all fields, his natural ability to hit." Continued progress through playing time will go a long way in guiding the talented youngster up the ladder, and having a clean bill of health after his first injury has him excited to get back on that path. "It feels good right now, like it did before," Mountcastle said. "I'm grateful that it healed well. I feel back to normal." Turning bats over: After logging a season-high 11 strikeouts in a complete-game shutout during his last start on Sunday, Erie's Spencer Turnbull pulled into the league lead with 72 whiffs. Of the 1,101 pitches thrown over 63 innings, the Tigers' No. 29 prospect has fired 63 percent for strikes. Across his last three starts from May 30-June 10, the right-hander went 1-0 with a 1.47 ERA and 21 punchouts over 18 1/3 innings. Return to form: Having missed much of May with shoulder soreness in his pitching arm, Akron righty Aaron Civale returned with four shutout innings in which he allowed two hits and struck out two. The Indians' No. 10 prospect, who turned 23 years old on Tuesday, has been very effective for the RubberDucks this season, posting a 2.23 ERA over seven starts, throwing 69 percent of his pitches for strikes. Striking for time: Only twice in his 11 starts this season has Altoona ace Mitch Keller recorded fewer than five strikeouts, both times coming in the only two outings in which he failed to go at least five innings. Since his last such start, which lasted 4 1/3 frames and saw him strike out one against Bowie on May 9, the Pirates' top prospect has gone at least six innings every time. In those five starts, the righty was 3-0 with a 3.09 ERA and 33 strikeouts over 32 frames.